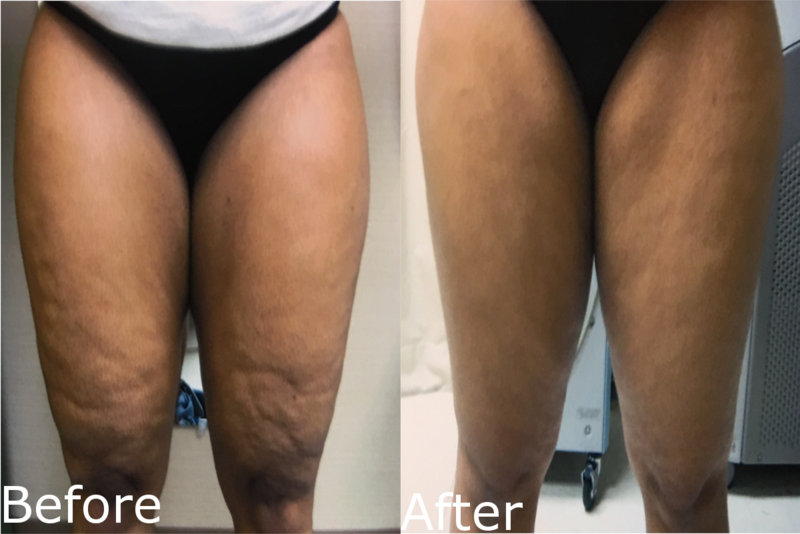 We offer a long-term, one-time, minimally invasive treatment called Cellulaze™ in our Bloomfield, Connecticut practice to reduce the appearance of cellulite. Cellulaze™ (sometimes misspelled “Cellulase”) is the only treatment that addresses and destroys the root cause of cellulite. Cellulite is not a fat problem; it’s a structural problem below the skin. Using Cellulaze™, we attack the three structural components of cellulite that are the real cause of the skin’s dimpled appearance: fatty deposits, thin skin and fibrous bands. 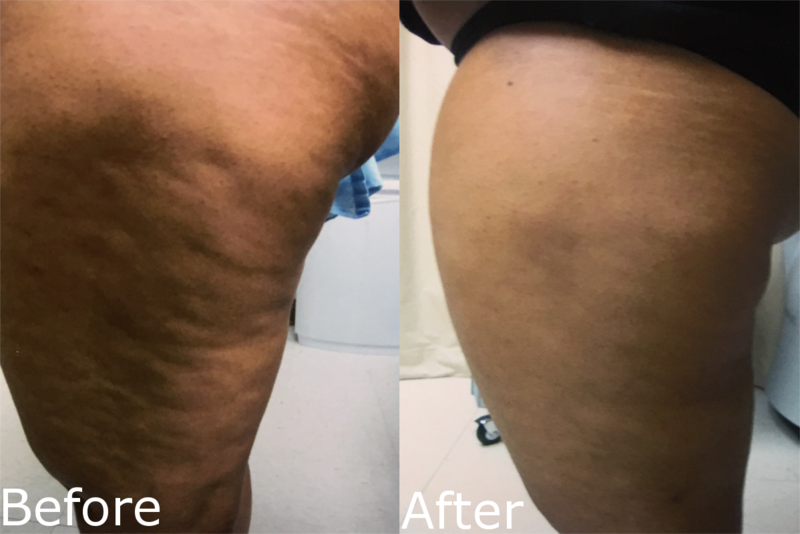 The procedure eliminates bulging fat, divides the fibrous bands and increases the thickness of the skin all in one treatment. 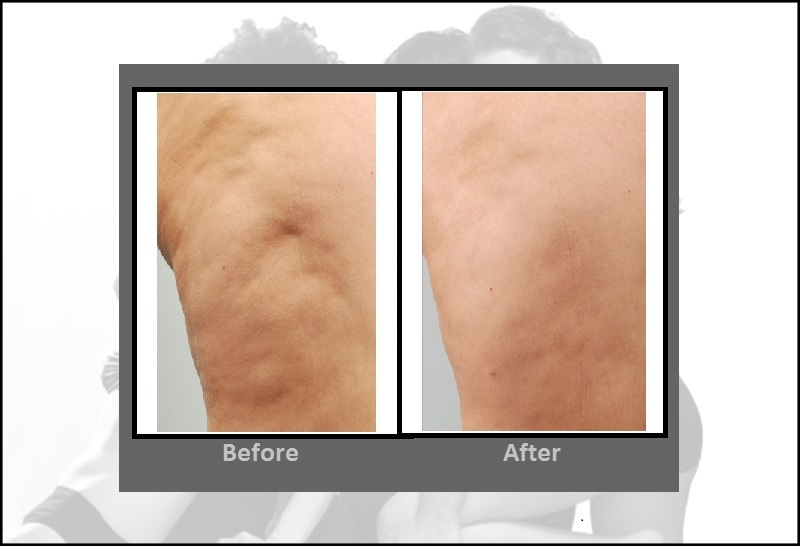 We are the first practice in the Greater Hartford area to offer this innovative, new cellulite removal treatment. The procedure is performed in an office visit and causes minimal downtime. If you have any questions or would like to make an appointment, call us at 860-242-0497 or Contact Us. The Cellulaze™ treatment is performed by inserting a very small cannula (or tube about the size of the tip of a pen) with a proprietary SideLight™ laser fiber inside of it which allows the delivery of energy directly under the skin. The precise SideLight laser energy increases the depth and quality of your skin, while simultaneously releasing the fibrous bands that pull down on your skin, resulting in the significant reduction of the orange peel look associated with cellulite. 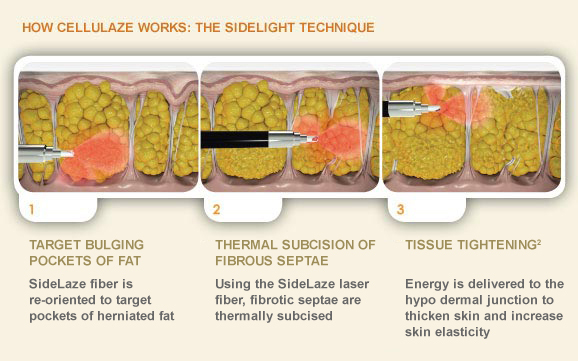 The laser is also used to diminish the lumpy pockets of fat that protrude though the fibrous bands under your skin. I have tried everything to get rid of cellulite. How do I know it really works? Cellulaze™ is backed by two years of clinical research and cleared for use in the United States. Clinical data has proven these treatments can increase the thickness of the skin by 25% and increase the skin’s elasticity by 29%. Thicker and more elastic skin can help flatten and smooth the skin’s surface therefore improving the appearance of cellulite. In addition, 100% of patients surveyed were satisfied or very satisfied with their results one year after their procedure, and all would recommend the treatment to a friend. The best candidates are women who are not significantly overweight but have cellulite on their thighs. A complimentary consultation with one of our medical providers will determine if you are a good candidate for this procedure. Only one treatment should be necessary to achieve the desired results*. You’ll see some immediate results, but final results won’t be apparent for three to six months. There is minimal discomfort associated with the treatment since patients are treated with a local anesthetic to numb the areas that will be treated. Patients may feel slight pressure or a warming sensation in and around the areas to be treated, but these are mild sensations. Patients are able to talk with the doctor during the procedure because they are awake and not sedated. Are there any side effects associated with treatments? Cellulaze™ is a minimally invasive surgical procedure, therefore after the treatment there will be some swelling and a little soreness. Further, patients may have some fluid leak out of the incision sites during the first 24 hours following the procedure. Most patients are able to return to their normal activities in a day or two. No, it is an in-office procedure performed under local anesthesia in our Bloomfield, CT practice. Since new collagen is formed and the structures under the skin are altered in the areas treated, the results should be long lasting. However, it is important to follow a healthy diet and exercise regimen to maintain the results.